One of the mysteries of the internet era is the reactivated customer. Fifteen years ago, you had a file of customers who had not purchased from you in years. These customers were a valuable asset --- really valuable! And they didn't have as many shopping opportunities as they have today, so you could mail them a catalog, and they might purchase ... at least purchase at a rate that was profitable. That was 1994. We have to think about 2014. The next decade will require us to figure out how to "stay in touch" with the lapsed buyer --- I mean, how the heck are we going to reactivate these folks? Remember, so many of them don't want to receive an e-mail or a catalog from us. For others, we've already met their needs, they're done with us. And then you have that whole crowd that are loyal to Google, not to us. The first step is to simply have the dashboard in place ... especially if you're an online marketer. Strongly encourage your web analytics team to move into reporting of this nature. Next, look at what your trends are over time. Are you able to reactivate these folks? Then ask yourself, "what tools do you have to reactivate customers"? If you don't have catalogs, how the heck do you stay in touch with folks who last purchased from your brand three years ago? It's a mystery! E-mail might be part of the story --- though half of your file doesn't want to get e-mail messages from you, so think about how the heck you stay in touch with the other half. Today, Google represents the most effective way to keep in touch with lapsed buyers, should you not have a catalog or e-mail marketing or direct mail strategy for lapsed buyers. Your SEO or paid search or social media program keeps your business "out there" for that day when the lapsed customer is ready to buy again. At some point, the social media folks might catch on to this ... the concept of staying in touch with lapsed buyers. And if this happens, there might be some promise in this whole social media thing. 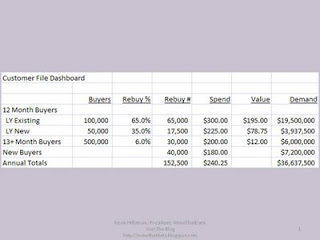 As you can see in the table, lapsed buyers becoming reactivated buyers can represent between ten and twenty percent of your business ... so it isn't a trivial amount of sales, is it? Ok, your turn. Pretend you don't have catalogs or e-mail campaigns or direct mail ... how do you encourage the customer who last purchased from you three years ago to buy from you again? I think something physical in the mail is a good idea. Whether it's sending a birthday card or a small holiday gift, it reaches people more than something online does. There are lots of small items for under 2.00 that are nice to send out.